Are you tired of dealing with your tangled and unsightly beard, one that is dry and stringy? Well, if you are just using beard oils, you are not doing enough. A good brush, a boar bristle brush can help improve beard health and manageability. So, let’s take a closer look at some candidates for the best boar bristle brush for beards. This is one of our favorite boar bristle brushes as it comes from a trusted brand name; it is not expensive, and it gets the job done. This brush is made with 100% real boar bristles. These bristles are quite long and stiff, making them great for beard grooming; they are able to get deep down into beards, penetrating and separating hairs for easy grooming, styling, and maintenance. This brush also has the advantage of helping to spread around butters and oils with much more efficiency and accuracy. It is a good way to help spread natural oils for a healthy beard and skin underneath the beard. This particular product also comes with a wooden beard grooming comb which we like quite a bit. On a side note, the hard bristles also help to massage the face, remove dead skin, and get rid of beardruff too. 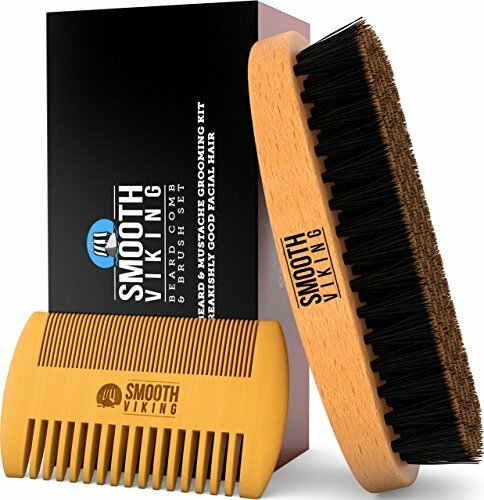 The Smooth Viking Beard Care Boar Bristle Brush also features an easy-to-hold handle. We like pretty much everything about the Smooth Viking Beard Care Boar Bristle Brush. It does not cost very much, but is made with real wood and high-quality boar bristles. Moreover, the stiffness of the bristles makes it great for tough-to-maintain beards. It works really well for spreading around natural oils for a healthy beard and it definitely makes facial hair more manageable. Coming with an extra comb is a bonus. The only bad thing we have to say here is that the kit seems to be missing the comb as advertised, as many people have stated. Also, the wooden handle on the brush might not be built with durability in mind. 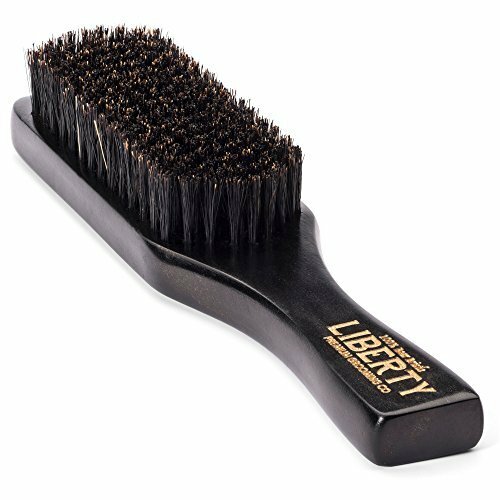 Liberty Grooming is another trusted and well-known brand name when it comes to men’s grooming and they have not failed to deliver a high-quality product with this particular boar bristle brush. For one, the Liberty Grooming Boar Bristle Beard Brush has a solid hardwood handle with a nice black finish; it looks really nice. Also, the wood is quite durable, plus it has a good shape that makes it ideal for holding and brushing your beard. This brush is made only of 100% rear boar bristles, and nothing else that can damage your beard, nothing like plastic or vinyl. Moreover, the bristles are quite long and stiff, just like with other boar bristle brushes. The Liberty Grooming Boar Bristle Beard Brush is perfect for massaging the skin underneath the beard, relieving itchiness, and brushing out old skin and beardruff too. At the same time, the stiff nature of the bristles helps to penetrate deep down into beards, thus untangling and straightening them, making your beard easier to manage. There is also the fact that it helps to spread around essential oils for a healthy beard. We really only have good things to say here; the boar bristles are real and authentic, they are stiff and great for untangling beard hair, and their nature helps them spread around oils with ease. The handle looks nice, is durable, and easy to hold as well. The Liberty Grooming Boar Bristle Beard Brush comes with a comb that is more or less useless compared to the actual brush. The boar bristles on the brush may also come loose after prolonged use. Yet another good mid-range boar bristle beard brush, the Fento Boar Bristle Beard Brush doesn’t cost much, it is authentic, it works well, and comes with a comb too. 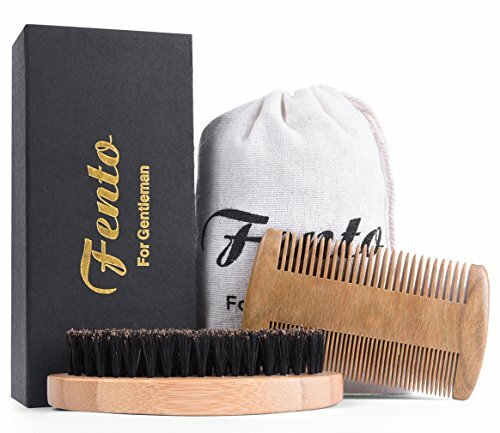 The Fento Boar Bristle Beard Brush features a natural bamboo handle, which is a good choice because bamboo is durable and quite sustainable to grow and harvest. All in all, we really like this handle. Moreover, the brush itself is made with all natural and 100% real boar bristles. There is no nylon, plastic, or other manmade materials used here. As with the other options we looked at, the boar bristles here have many benefits. They help straighten and untangle hair, thus making beards easier to manage. The Fento Boar Bristle Beard Brush helps spread oils for hydration, plus it feels nice on the skin underneath. This brush also comes with a comb and a carrying bag. This is an all-around good boar bristle brush to consider. It is quite durable, it works just as advertised, and it does not cost too much. We like the fact that you get exactly what is advertised. The comb that comes with the brush is not very good. Also, the boar bristles tend to come loose after a while, which is not great. At the end of the day, we think that the Smooth Viking Beard Care Boar Bristle Brush is the best overall choice to go with for pretty much every reason. However, if you don’t like that one, the Liberty Grooming Boar Bristle Beard Brush does make for a good alternative.